Our entry into Chile wasn't simple, but compared to the Argentinian border fiasco, it was perfectly smooth sailing. Our bus was scheduled for 7-8 hours, but between customs, construction, and an 18 wheeler accident, we pulled into Valparaiso roughly 12 hours after our departure from Mendoza. This wouldn't have been so much of an issue except that my Swedish friend and I hadn't exactly booked a hostel in advance - not usually an issue in a smaller city, but for a picturesque getaway town on the ocean on a holiday weekend… maybe that wasn't the best laid plan. We were traveling with a Swiss girl from our previous hostel and a German guy we met on the bus, so we stopped at her hostel first to see if there was any room… unfortunately no. As we wound through the streets towards the other guy's hostel, we stopped at a dozen or so other options, none of whom had room either. Just as we were nearing panic, we arrived at the boutique hostel our friend had pre-booked. Exactly two beds available in the dorm room, and the fanciest hostel I've ever seen, for roughly $28 US per night. Sold. The common areas were chic, clean, and modern - artfully arranged, and the beds were the most comfortable I've experienced in bunk form. And then there was the breakfast. No buffet - rather, we were served tea or coffee, a small arrangement of the day's selection of fruit and nuts with a small serving of fresh orange juice, followed by a bowl of the best scrambled eggs I've ever had (separate the whites and the yolks to prepare them, then bake - Chilean style) and some fresh rolls with butter and jam. If you have the chance to stay at MM450 in Valparaiso, please, by all means, treat yourself. 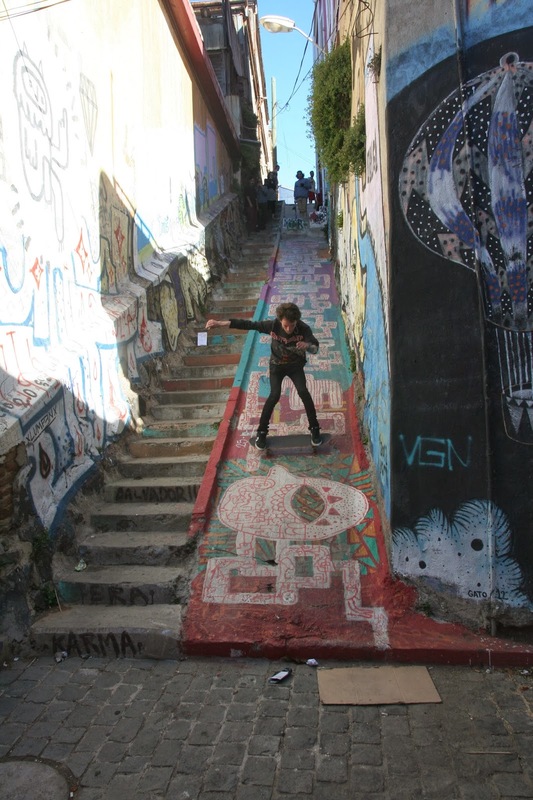 By far the best thing to do in Valparaiso is… simply wander. There are so many small alleyways and stairways and hills and winding roads, all full of incredible street art. Around every corner, there's an art gallery full of local work in a variety of styles, boutique clothing shops, and eclectic cafes. As I try to do in every city where it's available, I took the free walking tour offered by Tours for Tips that meets in Plaza Sotomayor at 10am and 3pm every day. The tour was not only an informative way to see much of the city and get great tips for later on, but we met a great group of fellow travelers, many of whom that we would continue to travel with and/or hang out with over the next week (or perhaps longer). I also took advantage of the boat tours that cruise around the port and shoreline on a regular basis. While the actual tour information was entirely in Spanish (and thus completely lost on me), it provided a wonderful view of Valparaiso (and a far off one of Viña del Mar), the Naval ships (we happened to catch them just as they were going through ceremonies to take the flags down for the end of the day), and the port on a gorgeous early evening. Almacén Nacional - We ate here for dinner twice, right down the road from our hostel, they served a variety of fresh, delicious Chilean varieties and seafood in an artful, warm atmosphere. My personal favorite was the 'cooked for 5 hours' pot roast with garlic risotto. Exactly. El Peral - I stumbled upon to this phenomenal spot while wandering through town - it's tucked away near Paseo Yugoslavo and serves a different menu each day. The selection when I was there included falafel or crab salad (with avocado, tomato, and citrus) for an appetizer, and crevice or shrimp & mushroom risotto for the main course, with a choice of coffee or dessert. The small patio is shaded by trees, but overlooks the harbor below. Casa de Cervesara Altamira - The local brewery… you can sample a flight of the four house selections, with generous portions.. my personal favorite was a rich Irish stout with notes of coffee and chocolate. There's also a bar just across the way that has a bus inside that serves excellent Pisco Sours … if memory serves. From Valparaiso, I continued on to Santiago with my Swedish friend Josefine, where we would spend a few days before she continued south with friends from our Valparaiso tour and I would head to Easter Island. We stayed in a hostel that wasn't fancy by any means, but was situated in a gorgeous location, just off the Parque Forestal and just a few blocks from Lastarria, which would quickly become my favorite neighborhood. We again made sure to take advantage of the afternoon Tours for Tips, and I also found myself another CrossFit gym for a couple of quick visits - Alianza CrossFit, a few short metro stops away from my hostel. We also attempted to take the funicular up to the Parque Metropolitano de Santiago one afternoon, but since the workers were on strike, we wound up having a beer with a huge group of local students at an outdoor patio bar down the road called Harvard, an entertaining experience as everyone was quite amused at the group of gringos entering their bar. My second brief stay in Santiago came after my return from Easter Island, and was intended to be an opportunity to rest and recover from a week of nonstop activity. This time, I stayed with some South African friends I had met back at the Valparaiso walking tour who are living and working in Santiago for six months. I was definitely in need of that rest after they took me out for a big night of way too much Pisco as soon as my plane landed! During this visit, I also thankfully managed to get up to the Parque Metropolitano de Santiago and enjoyed a lazy long walk down the hill after taking the funicular to the top. I was also in Santiago during the country's national election, after seeing campaign posters plastered everywhere the minute we arrived in Chile. I was impressed to say the least that in a country known for being highly conservative, the two top candidates for President were both women. Despite one receiving over 46% of the vote and the next highest being around 25%, they will have a run-off in December between the two since no one received 50%! Emporio La Rosa - Incredible gelato, with flavors that change daily. Located just off the park, so it's easy to grab a cone to go and enjoy the afternoon sun and the shady trees from one of the many benches. Hogs - A hip and trendy little hot dog walk-in just down from Emporio La Rosa. Hot dogs are a big thing in Chile, and here you can get a massive variety of toppings, sizes, and types of meat for your dog. Just make sure you grab plenty of napkins. Bocanariz - A fancy wine bar where we sampled a flight of local varieties. If you're hungry the tapas and entrees are a bit pricey but delicious. Wonderful - My favorite cafe, hands down. Fast wifi, delicious espresso beverages, and sweet French macaroons in a variety of flavors. Fuente Alemana - When I heard it was recommended by Anthony Bourdain and was near my hostel, there was no way I was leaving without trying this gem. It has the feel of a hectic old diner when you walk in, and when we arrived it was packed full of locals. The sandwiches are phenomenal and enormous. Next up will be a very lengthy post on my time on Easter Island! !